Our thesis students are kicking off their term with an open casting call for talents in Cebu! 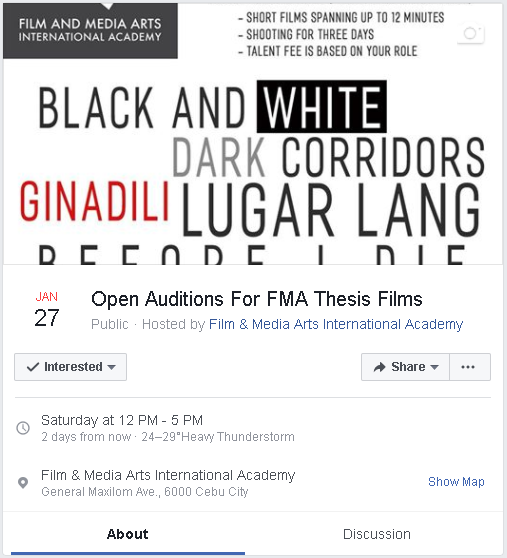 To be held on 27th January (Saturday) on FMA’s campus, it’s your chance to flex your performing chops and experience what being on set is like! No acting experience is necessary, just come with an open mind and a team-playing spirit! See you then! The FMA Filmmaking one-year Diploma Program focuses on seven core disciplines needed for any 21st century filmmaker: Writing, Producing, Production Design, Directing, Cinematography, Sound Recording/Design, and Editing. The program is designed for students beginning in media with no prior knowledge, and will give students the skills necessary for an entry-level job in many different ares of visual media. Be a part of FMA!